Continued explosive growth for TCPA, finishing 31.8% ahead of 2015 and decisively overtaking the #2 spot from FCRA – even if it didn’t quite crack 5k this year (if I can make the safest-sounding prediction for 2017 this early, look for TCPA to surpass 5k filings this fall). 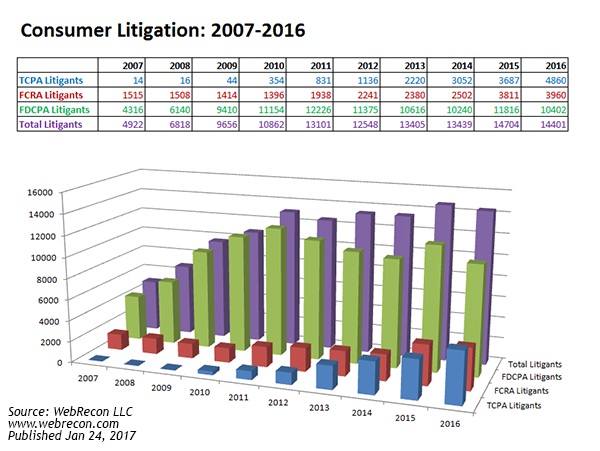 Putative class actions were all fairly robust in 2016, with 17.1% of all FDCPA suits being filed on behalf of a class, as well as 21.3% for TCPA and 9.7% for FCRA. Todd Friedman in California was the most active consumer attorney of the year, representing 410 consumers. A total of 14,401 consumers were plaintiffs in 15,860 separate filings for the year. Of those plaintiffs, about 4995 (or 35%), had sued under consumer statutes before. 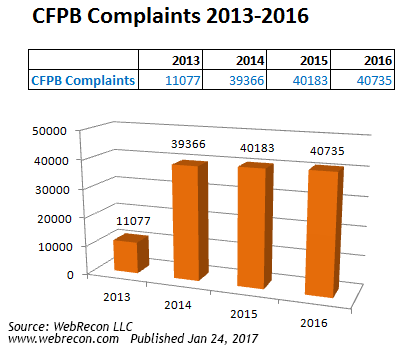 CFPB complaints, as expected, overtook 2015’s numbers – but just barely at 1.4%. That is consistent with 2015’s small 2.1% increase over 2014. 2013 was an incomplete year (and the first year) so its numbers don’t say much. Read on for all of the numbers! Of those cases, there were about 1191 unique plaintiffs (including multiple plaintiffs in one suit). Of those plaintiffs, about 452, or (38%), had sued under consumer statutes before. About 789 different collection firms and creditors were sued. There were 3433 complaints filed against debt collectors from Dec 01, 2016 to Dec 31, 2016. This includes 3173 (92%) timely responses to complaints, and 260 (8%) untimely responses. Of the company responses, consumers accepted 0 (%) of them, disputed 528 (15%) of them, and 2905 (85%) were N\A.